Being one of the top most manufacturers and exporters of the various kinds of trolleys we offer wide range of tool trolleys and industrial tool trolleys. Finest quality material of construction with precise engineering ability provide robust outcome. Our experienced designers and engineers practically know very well the requirements of workspaces. So considering the safety and benefits of well organized tool storage systems, we have developed mobile storing and moving of heavy duty material. It is extensively used in automobile industries. MAXSTOR has developed mobile tool trolleys and industrial tool trolleys with tool storage, small spare storage and also a rigid work surface. It is an ideal combination of multipurpose features and functions. 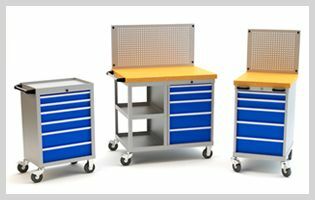 These tool trolleys and drawer cabinet with casters also called Mobile Trolleys and mobile drawer cabinet are the total storage for the work shop activity. For some industrial applications, movable inventories of tools are required for more than one function. We provide a great range of the industrial tool trolleys with multiple features and options for perfect need of the client. These multi featured trolleys are proven so helpful for the different manufacturing industries. It is ideally a useful solution for the variety of workspaces requiring mobile inventories of tools and equipments. We offer nylon, rubber, polyurethane wheels in set of 4, out of 2 are revolving wheels with break and 2 are fixing with 100 to 150 diameter. It is heavy duty trolleys with vibrant and innovative features. Load carrying capacities of up to 100 Kg.